(Chicago, IL) — January 19, 2010. Illinois Attorney General Lisa Madigan has tipped her hand in the race on Chicago’s north side to succeed John Fritchey in Illinois’ 11th House district. Madigan’s preferred candidate in the Democratic primary–which includes attorneys Dan Farley and Ed Mullen–is Ann Williams. 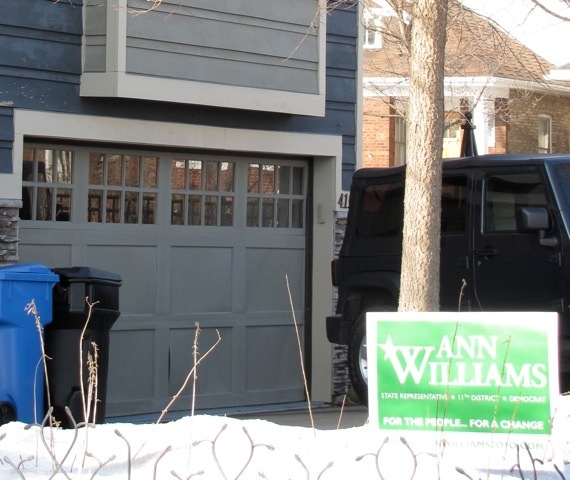 A drive by the Attorney General’s house reveals a “Ann Williams for State Representative” sign firmly planted in Madigan’s postage stamp-sized front yard and another in the front window. You don’t need to be whacked by a frying-pan upside the head to understand the meaning. Williams, an attorney, has worked on staff for both House Speaker Michael Madigan and the Attorney General. Madigan began her political career by winning a state senate seat on Chicago’s north side by defeating Farley’s father, State Senator Bruce Farley in a Democratic primary challenge in 1998. Williams, who has racked-up endorsements from the Illinois AFL-CIO, Brady Campaign to Prevent Gun Violence, Illinois Sierra Club, Planned Parenthood, Personal PAC, the Illinois Federation of Teachers, the Associated Firefighters of Illinois, House Majority Leader Barbara Flynn Currie, House Deputy Majority Leader Lou Lang, State Rep. Sara Feigenholtz and numerous other lawmakers, organized her campaign later than her opponents but quickly and skillfully ramped up her campaign muscle. It shows in Williams’ yard sign in Madigan’s front yard. Go Ann! Beat the political machine! Farley = same old political game and face. We need more women representing this city, state, and nation.